Traditionally, when someone thinks in terms of “pipeline” they think of the pipeline intended to generate leads for the sales folks. However, there’s another pipeline just as important but often ignored or given minimal attention. It’s the content pipeline for generating news about your company, its products, technical innovations, success stories and the like. This information forms the basis for ongoing website posts, trade articles and press materials. Good fresh content is the important means for driving prospects to your website and keeping awareness of your company at the forefront. Unfortunately, in too many situations, companies invest heavily in creating an impressive web site but then think that the job is completed. There is no pipeline. If there is no pipeline, you will miss valuable, on-going opportunities to get on the radar screens of important prospects and customers. The pipeline approach is an essential information gathering process for any company wishing to keep its web pages and blogs updated with new information. 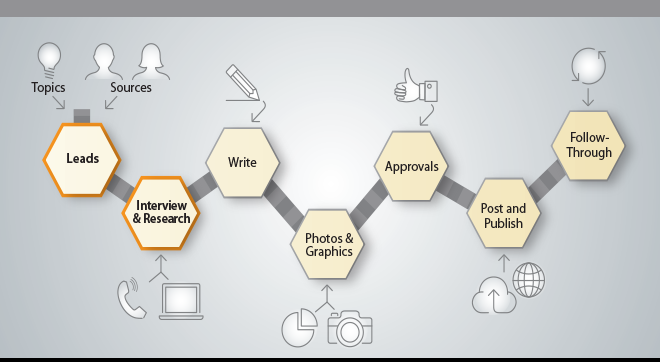 This article will deal with the seven primary elements of the pipeline process: securing leads, interviewing, writing, obtaining graphics, gaining approvals, selecting placement and following up. In a typical well-developed pipeline it wouldn’t be unusual to have a dozen items in play at various stages of the process. We might be working on five leads, two interviews, two articles being written, several placements and follow-through on others. In this blog we’ll deal with the first two pipeline items. A lead is just the name of a subject, but more importantly, the email, phone number and name of a contact person who can give you information. The lead could start with a specific idea and person attached to it or it could be an individual with multiple ideas. The lead might be someone within the organization…a product manager for example. Or it could be someone who is in the sales area or even a customer. And we, being good reporters, might take the subject and use it in several directions. The lead involves contacting that person, informing him or her of what our intentions are and arranging a time for an interview. This is a critical stage because it is important to build up trust with the lead. The lead has to be willing to allocate a period of time to the interview. They also need to know that whatever is produced will be returned to them for review so that they don’t have to worry about saying anything they don’t want to see in print. The interview is simply a conversation with a lead. It is recorded and transcribed. The interview might last fifteen minutes or, better still, around 45 minutes in order to get as much information as possible. Once we’ve collected the information for a particular subject, we may also discover other subjects worth exploring that came up during the interview. These can go on our leads list for further exploration and ultimately locating other information sources that can provide us with an interview. You can see that the interview process not only provides us with content for writing, but also additional leads for generating new subject matter. So the pipeline process is self-regenerating. Ross Hudson is a 30-year advertising and marketing veteran with particular experience in the business to business arena. This entry was posted in Uncategorized and tagged interview, interviewing, leads, pipeline, pressmaterials, products, prospects, recording, securing content leads, stories, technical innovations, trade articles, website posts. Bookmark the permalink.